This Coca-Cola Fishtail Embossed Metal Panel Art features the famous fishtail logo from the late 1950s and early 1960s. Made in the USA of heavy-duty steel. Available in 36, 48 and 60-inch widths. The Coca-Cola fishtail logo is very collectible among today’s retro Coke aficionados. The name for this distinctive design arose from the resemblance of both ends of the logo to a fishtail. Technically, it’s called an “Arciform,” meaning forming or resembling an arch. 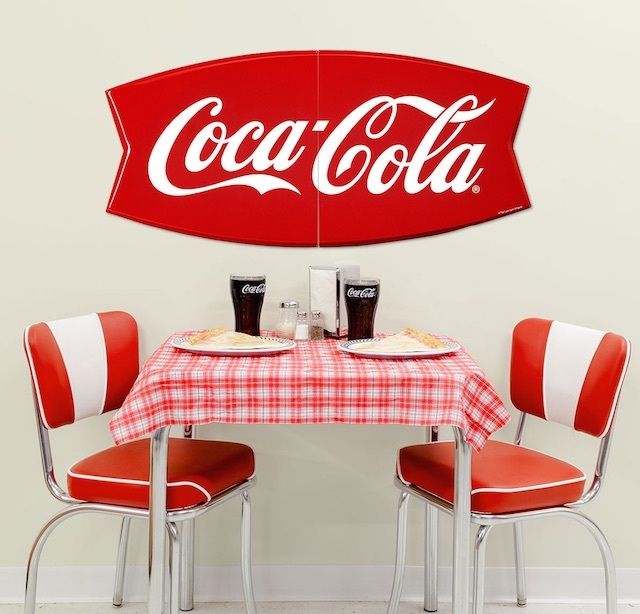 The Ice Cold Coca-Cola Fishtail 1960s Wall Decal is printed in the USA on polyester with a matte finish. Officially licensed by the Coca-Cola Company and available in 12, 24, 36, 48, and 60-inch sizes. First introduced in 1958, the fishtail logo appeared on signs, print ads, vending machines, coolers and all sorts of Coca-Cola products up until 1965. 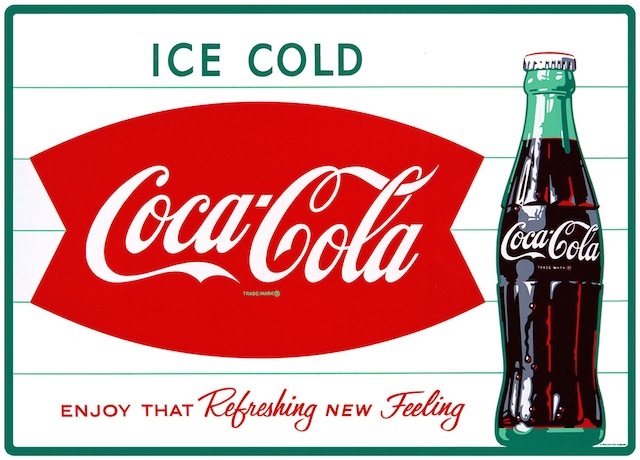 By then the Coca-Cola Company was phasing out this logo for the preferred red disc that had been used earlier. The belief was that the red disc was more readily identifiable as a Coca-Cola logo and was more graphically striking. But we sure do love the fishtail logo, too! 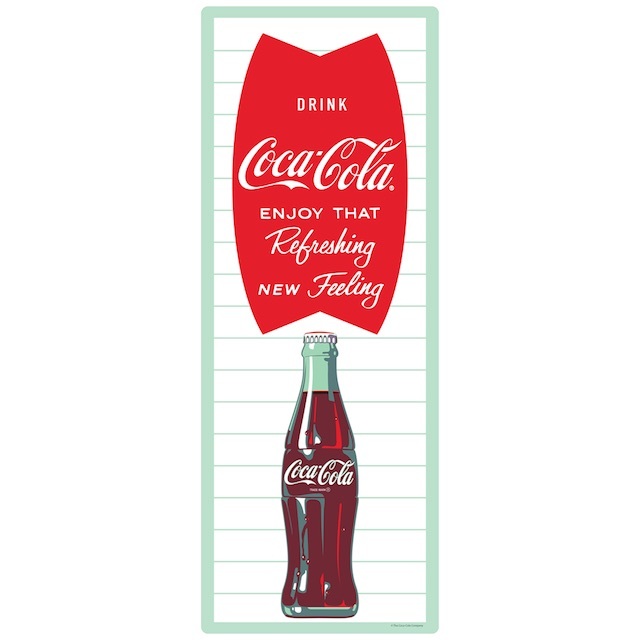 The Coca-Cola Fishtail Green Bottle Wall Decal sticks to most flat surfaces. Made in the USA, this decal is available in Available in 24, 36, 48, and 60-inch tall sizes. 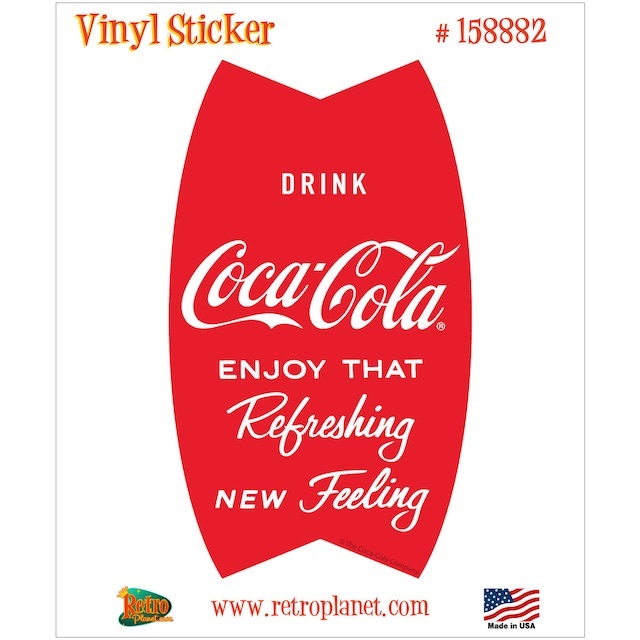 The Coca-Cola Vertical Fishtail Refreshing Vinyl Sticker measures 2.7 x 4.7 inches. 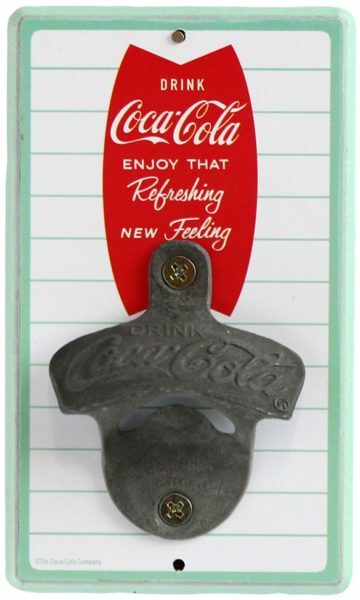 An officially licensed Coca-Cola reproduction and made in the USA. It’s easy to see what influenced the design of the fishtail logo in the late 1950s—automobiles in those years were sporting dramatic tailfins inspired by fighter aircraft of WWII and modern rocket designs. 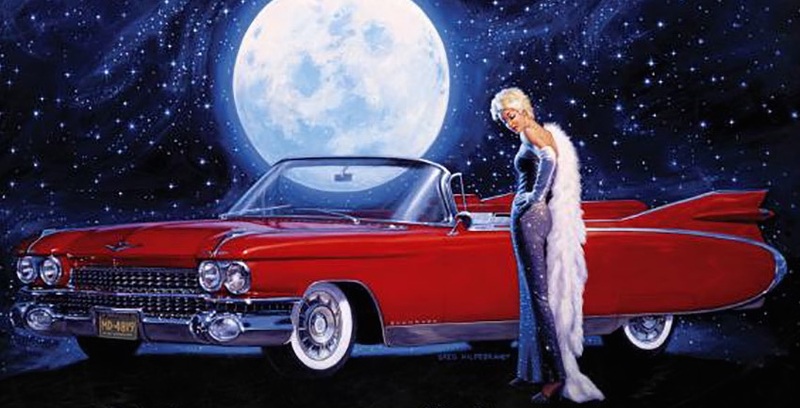 A 1959 Cadillac Eldorado Biarritz with dramatic “fin” taillight feature. Looking at this embossed metal sign it’s easy to see the influence 1950s car tailfins had on the design of the Coca-Cola fishtail logo. 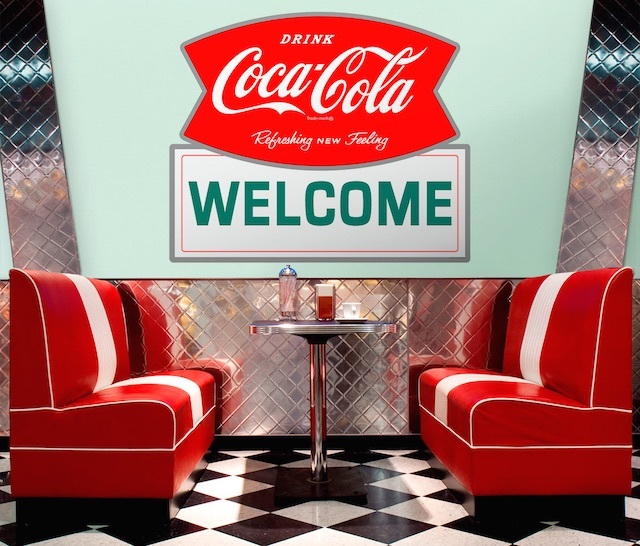 The Drink Coca-Cola Welcome Fishtail Logo Wall Decal will help you invite guests to your restaurant or home kitchen with nostalgic style. Available in 12, 24, 36 and 48-inch sizes. 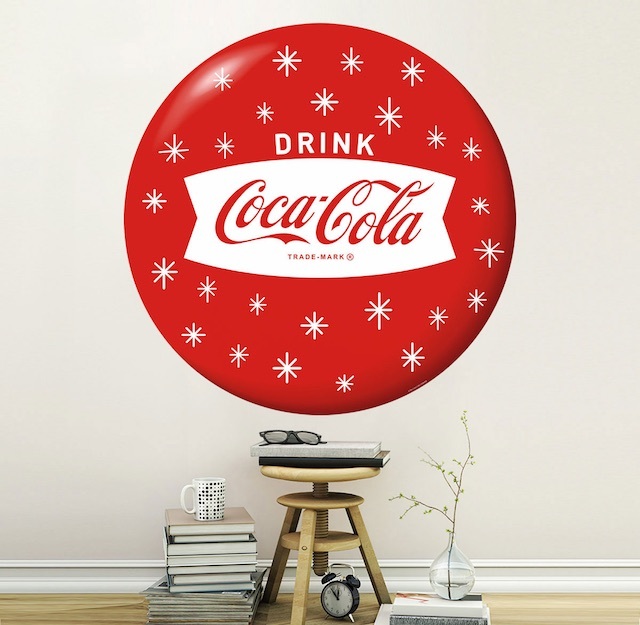 The Drink Coca-Cola Fishtail Holiday Snowflakes Red Disc Decal has the look of a vintage Coke metal sign. Available as a wall decal that sticks to most flat surfaces in sizes from 12 to 48 inches. 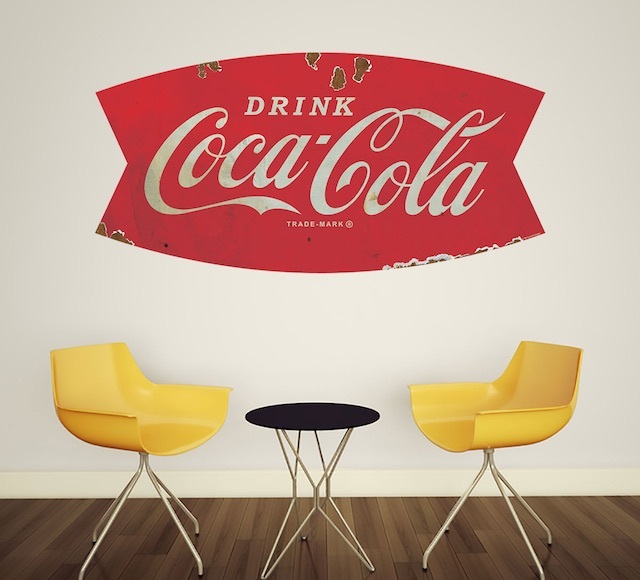 The Drink Coca-Cola Fishtail Logo 1960s Wall Decal Distressed has a cool distressed look, making it the perfect vintage accent for your decor. Available in 24, 36, 48, and 60-inch sizes and made in the USA. Since the Coca-Cola fishtail logo was used for such a short duration it’s become identifiable with a specific time period: the late 50s and early 60s. This makes it a desirable graphic for mid-century buffs in particular but its rarity makes it a favorite among Coke collectors in general. A nice alternative to high-priced vintage collectibles are the officially licensed reproductions we offer at RetroPlanet. 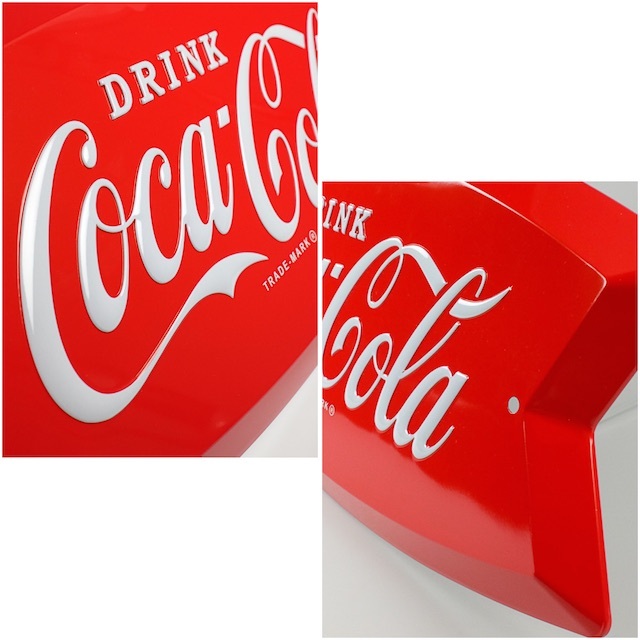 From large metal signs to wall decals to stickers—we have hundreds of Coca-Cola products to choose from overall and over 60 that feature the Fishtail or Arciform design. Watch our video for more information about the classic Coke fishtail design featured on our versatile wall decals.